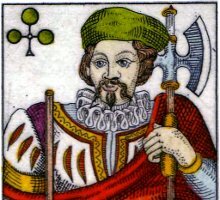 Karl Gerich's 12th deck is titled “Rheinland Playing Cards” and was published in 1991. lt is derived from Dondorf's Rhineland pattern, which was first published in the 1870s and widely copied ever since. The courts are double-ended with the spades in black, hearts in red, diamonds in yellow and the clubs in green. The cards are beautifully etched with a fine command of the material. The four Aces are plain. Alternative packs are in existence either with a self-adhesive vinyl or with a “Florentine” pattern paper back. The box has a phoenix motif, one of several motifs used by Gerich, which was a mythical bird consumed by fire only to rise again from the ashes, representing the triumph of life over death. 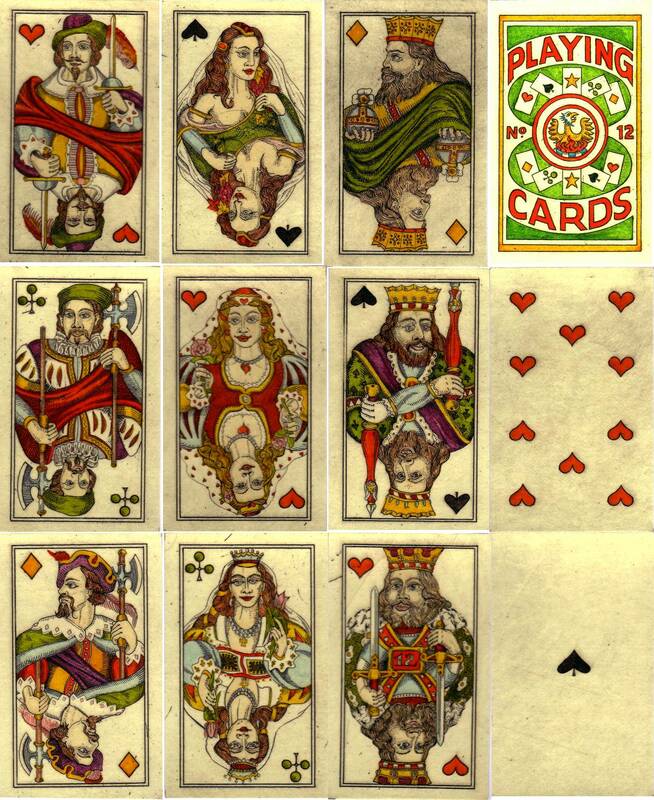 Above: “Rheinland Playing Cards” by Karl Gerich, 1991. The complete pack has 32 cards plus one joker (cross-legged mandolin player). The card at top-right is the box-top, showing Karl Gerich's phoenix motif which appears in several of his works. Each card measures 55mm x 86mm. Images courtesy Mike and Daphne Tregear.